Item Condition Brand new factory sealed. Hand-cut stained glass shade with each piece wrapped in fine copper foil for detail. Subtle star pattern surrounded by several deep color tones of garnet, green, royal, and amber. Twist design on an aged golden bronze cast-metal base to accent old world charm. Weighted foot with carved scrollwork for a sturdy base. Cord-mounted foot switch for convenience. Measures 72"H x 15"Dia at shade. 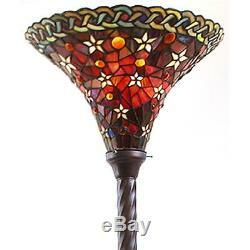 Position this Tiffany-style torchiere lamp in a dark corner to brighten it up. The hand-crafted lampshade is made of individual pieces of stained glass surrounded by fine copper foil to give it a vintage look. Scrollwork detailing accents the cast-metal base for an elegant look. A 100-watt light illuminates subtle white stars scattered among several iridescent stained glass pieces. These deep colors are accentuated by the golden-bronze color of the base, giving the lamp an old world charm. Use it in a library or home office to showcase its beautiful design and add warmth to the room. Other Items Thanks for looking. Special note for INTERNATIONAL buyers. Please take special caution that all electronics, electrical items, CDs and DVDs are formatted based on the United States Standards and may need an additional adapter to work in the countries outside of the USA. Please be sure to check that these items are compatible for use outside the USA. 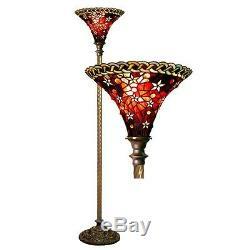 The item "Tiffany Style Vintage Reading Floor Lamp Torchiere Star Red Stained Glass 72 H" is in sale since Tuesday, September 27, 2016. This item is in the category "Home & Garden\Lamps, Lighting & Ceiling Fans\Lamps". The seller is "philp1954" and is located in US. This item can be shipped to United States, Canada, United Kingdom, Denmark, Romania, Slovakia, Bulgaria, Czech republic, Finland, Hungary, Latvia, Lithuania, Malta, Estonia, Australia, Greece, Portugal, Cyprus, Slovenia, Japan, China, Sweden, South Korea, Indonesia, Taiwan, South africa, Thailand, Belgium, France, Hong Kong, Ireland, Netherlands, Poland, Spain, Italy, Germany, Austria, Bahamas, Israel, Mexico, New Zealand, Philippines, Singapore, Switzerland, Norway, Saudi arabia, Ukraine, United arab emirates, Qatar, Kuwait, Bahrain, Croatia, Malaysia, Brazil, Chile, Colombia, Costa rica, Dominican republic, Panama, Trinidad and tobago, Guatemala, Honduras, Jamaica, Viet nam.